Wedding altars are serious business. Since the altar is one of the most important details of your wedding day, we put a lot of thought and effort into making them beautiful, show-stopping eye candy. After all, you're pledging your life to someone in front of it and the whole thing will be highly photographed, so it's got to look gorgeous! We adore dreamy, airy altars, but nothing makes us happier than a couple who asks for a completely over-the-top, highly detailed, fabulous altar! Here are some altars from some of our more recent weddings at The Barn, as well as some oldies, that are a little bit crazy and totally awesome! The Barn's Instagram. This altar was from one of our elopements a few years ago, and it was maybe our most romantic altar ever! 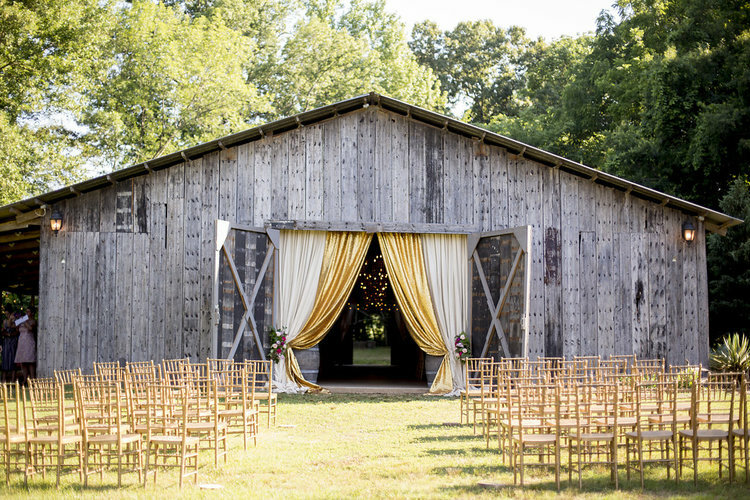 Barn Brides always make us swoon! (Barn Grooms are seriously the luckiest.) They always wear the prettiest bridal gowns and accessories, and we always love the hairstyles they choose for their big day. Picking a hairstyle for your wedding day is kind of intimidating. It needs to look good with the neckline of your dress and whatever necklace or earrings you may be wearing. It needs to stay put through an entire day of photos, wedding festivities, and a night of dancing. Most importantly, it needs to be something that makes you feel confident and like the most beautiful bride in the world! Whether it's a classic updo, romantic curls, a beautiful hair accessory, or something a little more unique, we're always blown away by our brides' lovely locks! Yesterday we started recapping last year’s spring weddings. Our upcoming wedding season kicks off later this month, and we’re celebrating by swooning over last spring’s weddings all over again! If you missed them on the blog the first time around, now is your chance to catch up on all the prettiness. Our spring season runs from March through June, and yesterday’s blog post highlighted some of the weddings that took place between March and May. The weddings I’m sharing today were all from last June - it was a busy month! June is so magical out here at The Barn; the landscape is green and lush, the weather isn’t usually insanely hot yet, and it’s just so pretty. There’s a reason why this is one of our most popular months for weddings! Here are our stunning June 2018 weddings. Abbey and Jake’s wedding was literally a fairy tale. They chose a romantic woodland theme and a simple, neutral color palette of white, green and a few touches of gold. We’ll forever be obsessed with their altar, with its unique white drape, loads of ferns, greenery and white roses. We LOVED their simple, elegant white florals that included tons of greenery, as well as their chic, understated reception details. We also thought Abbey’s dress was one of the prettiest ever. Basically this is one of those weddings that you shouldn’t miss; every detail was gorgeous! We love a wedding with sparkles, and Delaney and Cy’s was literally perfect. Delaney saw a past wedding at The Barn that had a rose gold, glittery altar, and that inspired the theme and color palette for their whole day; they chose rose gold, blush, champagne, and white, and a glittery, glamorous theme. Delaney’s stunning gown fit the theme perfectly, and we loved that she chose simple white and blush florals. We loved the soft pinks in their bridesmaids’ dresses and bouquets, their glittery rose gold altar (with loads of blush flowers, of course! ), their feminine and glam reception, and that insane cake! Sydney and Michael’s rustic wedding was the same weekend as Abbey and Jake’s and Delaney and Cy’s weddings. It always amazes me how our team manages to transform The Barn from day to day - we had three weddings that weekend, each with a totally different look and theme, and our team pulled them off flawlessly. They were all SO pretty in their own way. We absolutely loved Sydney and Michael’s peach and blue rustic chic wedding. Their altar was one of our favorites of the year… I mean, just look at those peach and orange flowers and the gorgeous draping! I especially loved the denim accents used throughout their details. Oh my goodness, Ali and Chris’s ranch-style vow renewal was SO sweet and romantic. (Yes, vow renewals at The Barn are totally a thing!) This precious couple celebrated ten years of marriage with a pastel pink and light blue rustic, ranch-style, intimate ceremony and reception. Their ceremony was held inside The Barn, and there were hay bales, steer heads, beautiful florals, and rose petals scattered on a cowhide. We were obsessed with their hydrangea, rose and baby’s breath bouquets that were so sweet, yet perfectly fit their day’s rustic vibes. And Ali’s dress… holy smokes! Their kids were included in their big day, and it was seriously the sweetest thing ever. More vow renewals, please! Bring on the spring 2019 weddings! We are seriously so excited, we can hardly stand it! It seems like we are FINALLY coming out of what has felt like a never-ending winter, and y’all, we could not be happier to see this long, soggy, cloudy winter go! We’re kicking off our 2019 season at the end of this month, and in celebration of the long-awaited warmer temps and our upcoming spring season, let’s take a few minutes to swoon over our most recent spring weddings all over again. Spring 2018 was FULL of prettiness. Spring is straight up magic out here at The Barn, and our spring 2018 couples chose the most beautiful color palettes and details that totally played up all the prettiness that our venue offers in springtime. These are the stunning weddings from the first part of our spring season last year - they all took place between March and May. Tomorrow I’ll share the rest of last year’s spring weddings! Grab an iced coffee (it’s finally warm enough!) and enjoy! Stacy and Aaron’s mauve wedding last March was sooo pretty. We were especially into the shades of purple used throughout their details, their gorgeous florals, and their super chic, intimate reception that included loads of greenery garlands. Their ceremony, which was held in front of The Barn, was simple and elegant and so very pretty, with barrels topped with purple florals placed at the doors. Their reception was intimate, and it looked like pure magic under all the sparkling lights and chandeliers inside The Barn! This was the absolute prettiest way to kick off our spring 2018 season! The next month, Stacy’s cousin Nikki tied the knot with Mac in the prettiest vintage-meets-country elopement. (Both of these couples were some of our Kingfisher folks!) Nikki and Mac’s color palette was the ultimate combination of spring colors: pinks, mint, white and a little bit of orange. This wedding was so bright and just CHEERY. Their whitewashed pallet altar included bright, colorful florals and lots of greenery, and it was perfection. They also had one of the cutest cake displays ever! We loved the use of color in this one… every detail screamed springtime! I definitely have a soft spot in my heart for shabby chic weddings. I am forever swooning over this one! Holly and Tyler chose a soft, feminine color palette of lavender and allllll the shades of pink. We ADORED their florals, which included all the spring bouquet must-haves: peonies, roses and the prettiest purple flowers. Their altar was such a dream, with vintage white doors, bright pink florals everywhere, and vintage wood crates to keep things from feeling too girly (you’re welcome, Tyler!). The pink fringe details from their ceremony were some of my absolute favorite details from the whole day. We also loved their adorable cake table!